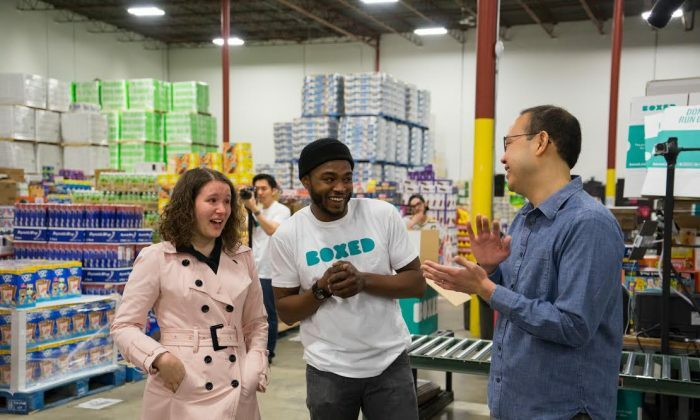 Chieh Huang of Edison, New Jersey, is the CEO of Boxed Wholesale, a company started in 2013 that offers free delivery of groceries and household products. The 34-year-old announced in May that the company will pay for employees’ weddings—even though they are getting double the minimum wage, Huang told the Epoch Times. However, Huang has always been gracious to his employees. Last year, Huang announced that he would start paying college tuition for the children of his employees out of his own pocket. So, why is the CEO of Boxed so nice to his employees? When employees face personal hardships, Huang wanted his company to help them. When Huang first started his company, he had the idea that he wanted to “treat his employees right”—when employees were going through hardships in their personal lives, he wanted his company to be able step in and help as much as possible. Huang’s kind offer—personally paying tuition for his employees’ kids—was because he and his older sister grew up poor. If children don’t have access to education, it will be a perpetual cycle. So far, Huang has paid for two separate students. “Four semesters are already paid for,” he said. He said there are five people in the program so far who are taking advantage of his offer, four of whom are already in school. These children are not limited to one particular school, either. They can go to any college of their choice—however, they are responsible for their own accommodations, Huang said. There are currently 128 full-time employees at Boxed Wholesale, and all of them are eligible for a paid wedding by the company. Boxed Wholesale will contribute $20,000 toward each wedding, Huang told the Epoch Times. The announcement was made at a company-wide meeting in the Edison fulfillment center to surprise Marcel Graham, 26, of North Plainfield, New Jersey. Graham’s mother had fallen ill and he had to cover her medical bills, while trying to save up money to pay for his wedding. But he later realized, because he has been covering his mother’s medical bills, there wasn’t enough left to put away for his upcoming wedding in November. “So, why not change that?” Huang thought to himself. He said that Graham “put his heart and soul” into the company, so it naturally felt like the right thing to do. Huang took matters into his own hands and decided that he would be paying for Graham’s wedding instead. Graham’s fiancée, Tara, was also at the meeting when Huang announced that Boxed will be stepping in to pay for their special day. Afterward, he announced that all full-time employees from their fulfillment centers in New Jersey, Atlanta, Las Vegas, and Dallas, as well as their corporate and support offices in New York City and San Mateo, California, will also benefit from this. Over three years, only two people have quit. He stressed that if employees are fired or have quit, they are no longer eligible. “Over three years, only two people have quit,” he said. Huang’s family, however, thinks “we’re crazy,” he told Epoch Times. “They expect any and everything right now,” he said. Being poor never left me, it keeps me motivated, and it also keeps me grounded. Huang describes himself as a “humble guy” and feels that he is “awfully lucky” to be in a good position in life. “[The memory of] being poor never left me, it keeps me motivated, and it also keeps me grounded,” he said. When asked what else he has up his sleeve for his employees in the near future, he said he doesn’t know for the moment.